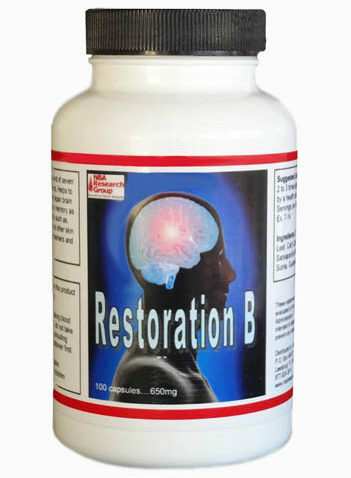 Restoration B helps restore and protect brain cells, improves poor memory as well as address skin disorders. For psoriasis and other skin conditions. For Alzheimer’s disease, dementia and memory loss. * for psoriasis and other skin conditions. * for Alzheimer’s disease, dementia, & memory problems. * for upper respiratory problems (coughs, bronchitis, chest colds). * cellular protector and anti-aging aid. * reduces inflammation, cleanses bowel, & fights cancer cells. * anti-cancerous, anti-viral, anti-candidal, anti-bacterial, immune stimulant. * for psoriasis, dermatitis, leprosy and other skin disorders. * as a blood purifier and general detoxification aid. * for arthritis, rheumatism and auto immune disorders which cause inflammation. * for syphilis and other sexually transmitted diseases. Ginkgo biloba…Ginkgo improves blood flow to the brain and acts as an antioxidant. Several ginkgo studies have shown that it can help with memory problems caused by dementia or Alzheimer’s disease. It seems to help prevent the progression of dementia symptoms, especially if the dementia is thought to be the result of atherosclerotic vascular disease. Lion’s mane…Lion’s Mane mushroom (Hericium erinaceus) is a nontoxic medicinal (and culinary) mushroom believed to stimulate nerve growth. Scientific research shows that lion’s mane contains a number of health-promoting substances, including anti-oxidants and beta glucan. In a study (published in Biomedical Research in 2011), scientists examined the effects of lion’s mane on brain function in mice. Results revealed that lion’s mane helped protect against memory problems caused by buildup of amyloid beta (a substance that forms the brain plaques associated with Alzheimer’s disease). Lion’s mane may help alleviate depression and anxiety. Sea cucumber…Sea cucumber is used in traditional Chinese medicine to treat a number of health problems, including fatigue, impotence and joint pain. Sea cucumber contains high levels of chondroitin sulfate, a major component of cartilage. The loss of chondroitin sulfate is associated with arthritis and taking sea cucumber extract may help to reduce the joint pain associated with this condition, according to an article by H. Benedikt, D.C., in “Dynamic Chiropractic.” Sea cucumber also contains natural anti-inflammatory compounds.Sea cucumber is rich with niacin, calcium, ta-urine, lysine and other elements to restore the brain fatigue, improve memory. Sea cucumbers provide vitamin A, B-1(thiamine), B-2(riboflavin), and B-3(niacin), and vitamin C as well as the minerals Calcium, Iron, Magnesium, and Zinc. Niacinamide (B3)…is a form of vitamin B3. Niacinamide is U.S. Food and Drug Administration (FDA)-approved for the treatment of pellagra, or niacin deficiency. Pellagra is a nutritional disease that occurs due to insufficient dietary amounts of vitamin B3 or the chemical it is made from (tryptophan). Symptoms of pellagra include skin disease, diarrhea, dementia, and depression. Taking niacinamide seems to improve joint flexibility and reduce pain and swelling. A study organized by Proctor and Gamble found that not only is niacinamide well-tolerated by all skin types, but also reduces the appearance of hyperpigmentation, redness, yellowing, and blotchy spots on the face. Many studies with mice are showing that niacinamide is improving memory and Alzheimer’s disease. Caution:Do not take if pregnant or nursing.